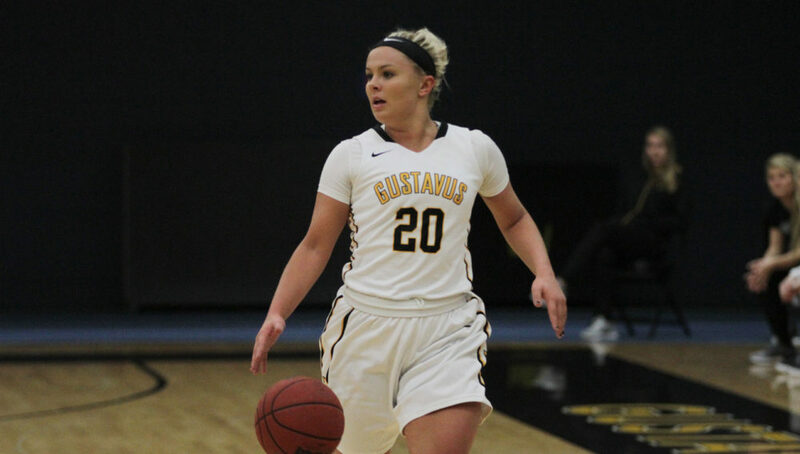 ST. PETER, Minn. – The Gustavus women’s basketball team earned its third consecutive victory Saturday afternoon at Gus Young Court, outplaying Concordia College in an 84-47 victory to improve to 11-2 overall and 5-1 in the Minnesota Intercollegiate Athletic Conference. The Cobbers scored on their first six possessions of the game while claiming an 11-5 lead through the first four minutes of the game, but Gustavus roared back on a 23-9 run to gain a 28-20 lead after the first quarter, and didn’t look back. Gustavus finished the first half shooting 20-for-35 (57.1) from the field and limited the Cobbers to just five points in the second quarter, taking a 49-25 lead into the intermission. The Gusties outscored the visitors 35-22 in the second half, eventually gaining their largest lead of the game at 7:48 of the fourth quarter, as two free throws from Gabby Bowlin (Fy., Winona, Minn.) gave Gustavus a 76-34 lead. Miranda Rice (Sr., Forest Lake, Minn.) shot 9-14 from the field with a team-high 21 points. Mikayla Miller (Sr., Goodhue, Minn.) and Kendall Thompson (Jr., Eden Prairie, Minn.) followed with 12 and 11 points, respectively. Gustavus forced 30 Cobber turnovers and owned a 48-22 advantage in points in the paint, while out-rebounding Concordia 38-32. “Anytime you get a big lead and get opportunities to get all your kids on the floor is always a great opportunity. Rebounding was a focus coming in so to see us win the battle on the glass was good. Every conference game is important so I feel it was a good win for us today,” Kelly concluded. The Black and Gold returns to action on Wednesday evening, staying at home for a conference matchup versus Saint Mary’s University.